It’s been a fall of firsts for Blackshear Bridge and Friends of Yellow Jacket Garden. Read all about it below. You can join in the fun. 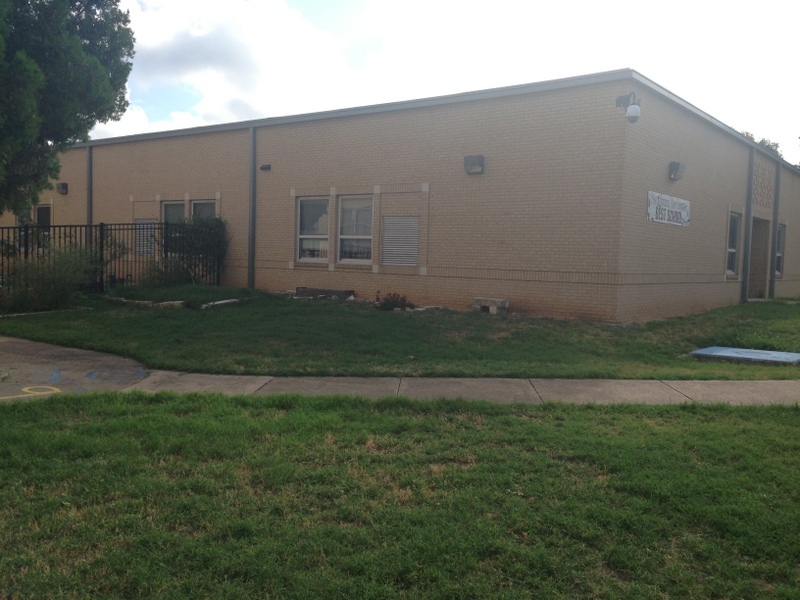 Tour and sign up to volunteer at Yellow Jacket Garden this Saturday at Little East — AISD’s art show produced by Principal Jenkins and Art Teacher Ms. Elisabeth Healey for the East Austin Studio Tour. It’s Little East! — Today Saturday, Nov. 21, 10 AM–2 PM at Blackshear Elementary School. In October, Blackshear Bridge began coordinating the Bread & Roses Community Farm Stand on first Fridays under the big oaks on the north east playground at Blackshear Elementary School. We pick up veggies from our friends at Farm Share to round out the supply grown by the children in Blackshear’s Yellow Jacket Garden. Thank you, Farm Share. This vital piece of the community food hub that Blackshear Bridge is building with our partners in central east Austin has raised the food conversation and menu to a new hum on la Loma, Prospect Hill. Thank you Catalina Berry with Seton Health. Seton Health is supplying bags and staffing the farm stand with Promotor@s de Salud, Health Promotors, Esmeralda Vera and Edwin Evans. Thanks, Esmeralda and Edwin, your smiles are like sunshine. 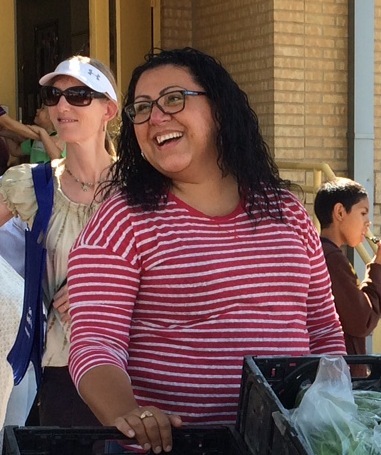 To add to the buzz, queen bee parents Rose Hernandez from Blackshear and Laura DiCarlo from Kealing Middle School’s Garden community are helping out. Thank you to all Bread & Roses Community Farm Stand volunteers! Next Bread & Roses Community Farm Stand is Friday, Dec. 4. Longtime volunteers and Friends of Yellow Jacket Garden – Jason Patman and Fax Hamilton eyed the ground just outside the garden gate for the past year as they accompanied the children during Enrichment Time on Fridays. They wanted to show the children how to capture the rain water coming down the spout by creating a rain garden for the plants. This year, they got the go ahead from Principal Betty Jenkins and Jason drew up a design. That is when we heard about the City Water Conservation Department’s new Waterwise Rainscape Rebate Program. A crew of three jumped right in – Jason, Habitat Steward Julia Heskett and I attended the City’s required Saturday class. We received some free pollinator plants for the Blackshear Rainscape in the deal. Thank you very much! Water Utility staff member Christopher Charles inspected the design and site. We got another green light! Then, Saturday, September 12, it was permablitz time! 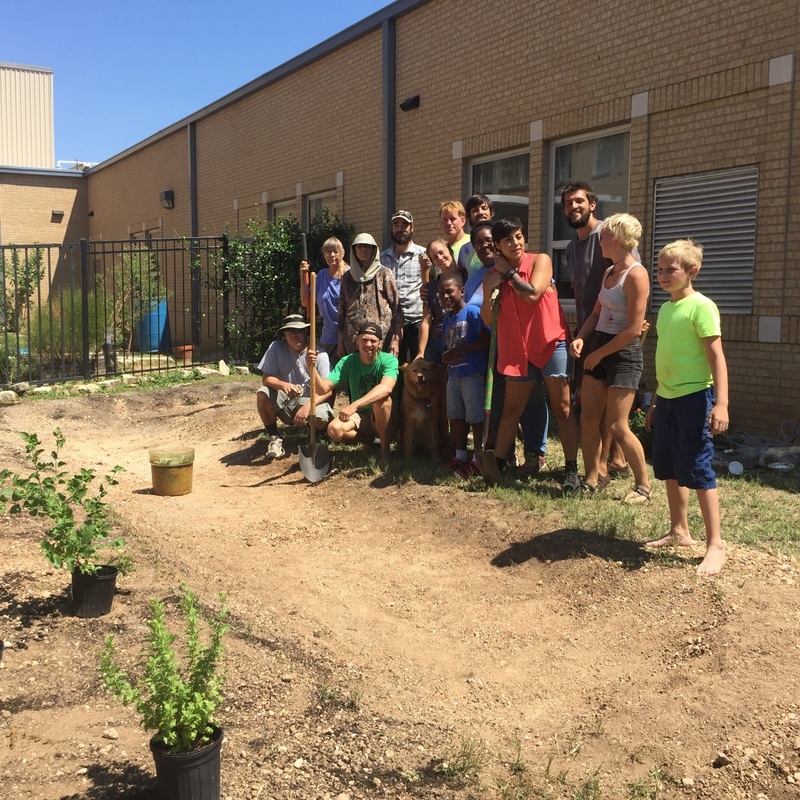 Blackshear parents and other friends of Yellow Jacket Garden including Southern Exposure lead Kirby Fry and members of Austin Permaculture Guild showed up to think and dig together. Fax supplied soaked edible bean and grass seeds and pine straw to cover the new rainscape. The result is a berm and swale, a pond-like trench next to a hill-like bank topped off with blooming basil, two meyer lemon trees, various wildlife habitat plants, and those crazy, ready-to-harvest beans. The new feature at Yellow Jacket Garden performed beautifully in the recent rains to hold tumbling storm water for the plants. Congratulations, Jason and Fax! Drop by anytime to see the new Rainscape at Blackshear – the City’s first qualifying Waterwise Rainscape Rebate project! Thank you to the folks who’ve helped make Blackshear Bridge progams possible this fall. Thank you to the Green is the New Black students from Huston-Tillotson University, to Jason, Fax and Courtney, to parents Ayesha Rogers and Billy Jo Elbom for volunteering with the children during Enrichment Time. Thank you Shannon and Matthew Jones for helping on Health Night and to all the parents working on the mural we will unveil in early 2016! Thank you to the staff of Blackshear Elementary School, Huston-Tillotson University, Keep Austin Beautiful, Sustainable Food Center, Farm Share, City of Austin Office of Sustainability, City of Austin Water Conservation & Watershed Protection, Lady Bird Johnson Wildflower Center, and Seton Health. Thank you to the staff of PSW Real Estate who came out for the Where does Water Come From lesson and rain dance with the kindergartners this fall. Thank you to Yoli Sanchez Neeck, Mary Beth Maher and our generous contributors to the Summer Moons Campaign and the folks who contributed during the Eclipsing Our Wildest Dreams fundraiser. Thank you to Blackshear-Prospect Hill Neighborhood Association, Gourmand’s Neighborhood Pub and Access Realty. Thank you to Jason Patman, Fax Hamilton and the permablitzers who created the new Rainscape and the volunteers who prepped the fall veggie beds. Thank you to Abby Wilkeson for painting the Yellow Jacket Garden sign on the little red wheelbarrow. Thank you to our star Board Members Amanda Masino and Gina Tillis and to star supporters Mary Beth Maher, Jason Patman, Yoli Sanchez-Neeck, Julia Heskett, George Lange, and Andrew Hands. Got art? Or, do you have artistic talent singing to be free? Well, bring it to Blackshear’s Yellow Jacket Garden this weekend! 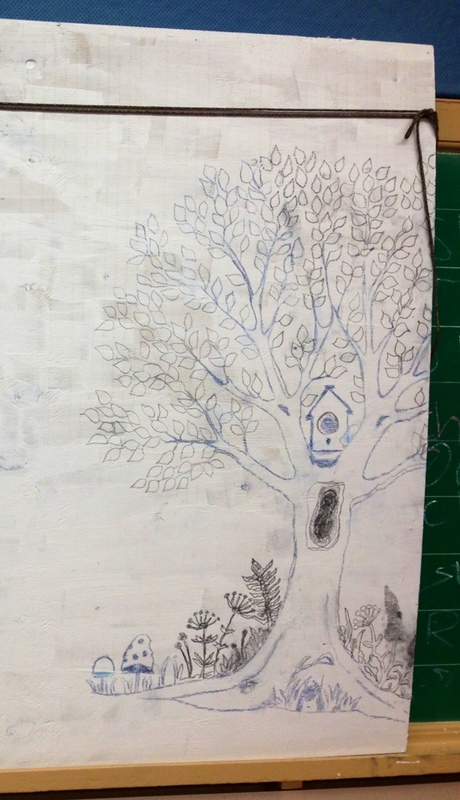 Friends of Yellow Jacket Garden – mostly Blackshear parents, are creating a mural for the back of the garden kiosk blackboard. The mural will help teach two concepts – The Stuff of Life – Sun, Air, Water, Food and Shelter; and, What to Plant in the Fall/Winter and What to Plant in the Spring/Summer. The Stuff of Life mural will support teaching in the garden including Inch by Inch: Putting the Garden in Kindergarten lessons that Blackshear Bridge provides every Friday and every other Thursday to about sixty children at the school. If you’d like to volunteer to help create the mural, RSVP to hello@blackshearbridge.org or phone 512-299-5776. Or just come by the school this Saturday, Nov. 21 for Little East on the East Austin Studio Tour on Nov. 21. Stay tuned for Blackshear Bridge’s end-of-year appeal. We need your support for the ongoing garden, wellness, sustainability and diversity programs we coordinate, facilitate, and support in central east Austin. 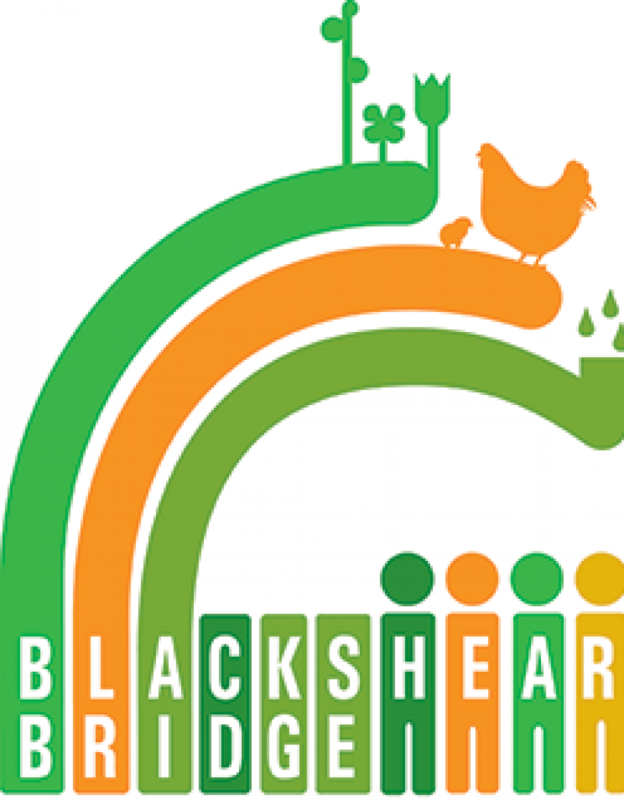 If you already know you want to make a contribution to Blackshear Bridge, Friends of Yellow Jacket Garden, Inch by Inch: Putting the Garden in Kindergarten, and the Bread & Roses Community Farm Stand, click on the big orange donate button here. Learn more about Blackshear Bridge on our website and follow us on Facebook. Feeling thankful for rain, fall flowers, cool temps, family and friends gathering! Congratulations to Principal Betty Jenkins and the staff, PTA, and families at Blackshear Elementary School for your national Blue Ribbon School award this fall! Huston-Tillotson University’s student group Green is the New Black and their faculty and staff sponsors have been invited to attend a global climate forum, the United Nations Climate Change Conference of the Parties (COP21) as part of a national Historic Black Colleges & Universities delegation in Paris this December. This is a historic opportunity for students and for HT. We believe that it is important for HT and for our students to bring HBCU voices to this global discussion of climate change. After the conference, the group will host a seminar at HT to share the experience with our campus community and act on what we have learned. Learn more about HT’s delegation to COP21 and how you can help. Congratulations to Austin’s new Festival Beach Food Forest! Over a hundred volunteers showed up November 7 to create berms and swales, plant and mulch trees and install irrigation next to Festival Beach Community Garden just east of I35 on Town Lake, aka the Colorado River. 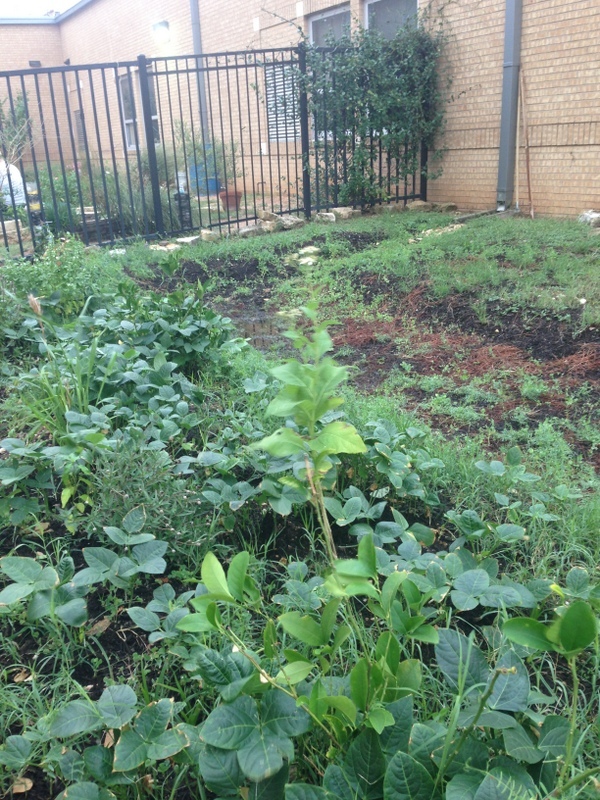 The Food Forest contains fruit trees that Austinites will be able to forage from in three to six years — loquats, dwarf mulberries, plums, figs, Texas persimmon, Asian persimmon, pears, pomegranates, peaches, blanco crab apple, moringas, elderberries. It also contains Texas native pollinator plants and plants to provide sight and sound barriers from I35’s traffic and noise. The Food Forest with umbrella group Urban Patchwork has applied to the Neighborhood Partnership Program for a grant to supply cover crops, benches, and signage and to build ADA pathways through the Food Forest for Phase II. What a wonderful thing for Austin!